The founder of P. Feinstein & Sons was Paizor Feinstein (1871/72-1940). His obituary in the New York Times (28 April 1940) reads in part, "Paizor Feinstein, head of P. Feinstein & Sons, manufacturers of men's clothing, of 28 West Twenty-third Street, died yesterday at his home, 473 West End Avenue, of a heart attack. He was 68 years old. Born in Russia, Mr. Feinstein came to this country in his youth. He entered the Feinstein firm in 1894, six years after it had been founded by his father, A. I. Feinstein." Three surviving sons are mentioned in the obituary: Abraham I. Feinstein (1895-1957), Benjamin Wagner Feinstein (1898-1946) and Herman E. Feinstein (1902-1975). These three constituted the sons in P. Feinstein & Sons. They are listed in the U. S. Census of 1910 living with their father at 79 Stanton St. downtown on the East Side. At the time Abraham was 15 years old, Benjamin 12 and Herman (called Hyman) 7. The sons did not follow their father into the family business immediately. Abraham Feinstein registered for the World War I draft in 1917 when he was a teacher at Public School 106 on Lafayette St. Benjamin Feinstein registered in 1918 while employed at Neale, Maas & Mayer Inc., woolen merchants on 4th Ave. By 1925, however, all three sons are listed as officers in the firm, which also did business under the name Admiration Clothing Co. Later both Benjamin and Herman Feinstein changed their name to Fenton. Herman is referred to as H. Frederick Fenton in his brother Benjamin's death notice (New York Times, 23 April 1946). His own death notice (Times, 8 Jan. 1975) gives the form Frederic H. Fenton. P. Feinstein & Sons were located at 28 W. 23rd St. from 1933 to 1965. In the late 1920s or early 1930s the Feinsteins became proprietors of the New York branch of Goodman & Suss, also located here from 1933 to 1965. 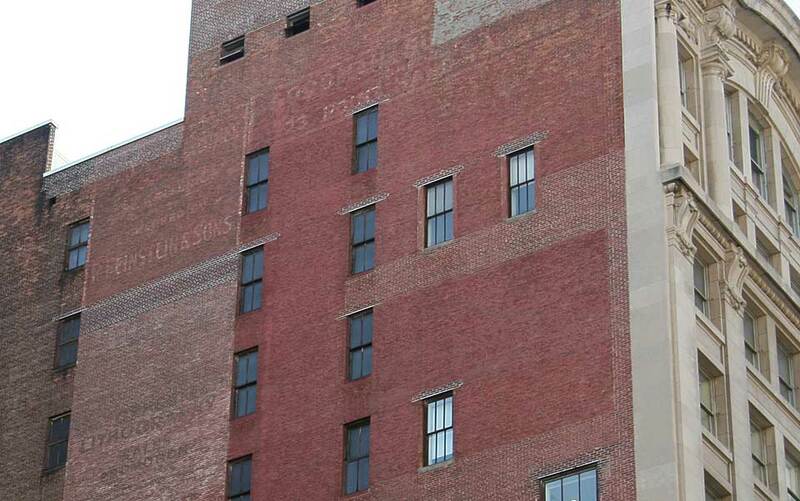 For more on Goodman & Suss see the west wall of 28 W. 23rd St.